Combine a city tour of San Diego with a jaunt across the border to Tijuana for an excellent overview of these two border cities. Explore San Diego highlights such as Old Town, Balboa Park, the Gaslamp Quarter and Seaport Village, traveling by bus with photo stops throughout the tour. Have time to walk around at some spots before heading over to Tijuana and shopping for Mexican goods on your own. Complete the experience with an optional upgrade for a 1-hour cruise on San Diego Harbor. Start your full-day tour with morning pickup from your San Diego hotel, then relax on board a climate-controlled bus with your informative driver-guide. 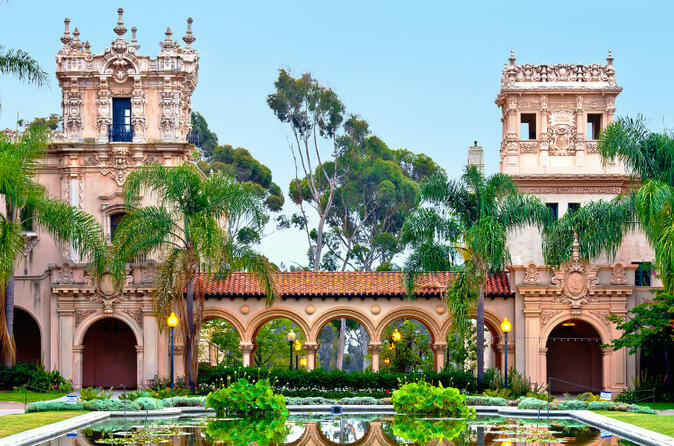 As you roll around beautiful San Diego and Coronado, stop to discover the highlights of Old Town, Balboa Park, the Gaslamp Quarter, Seaport Village, Seal Rock, Hotel del Coronado, Green Dragon Colony, Heritage Park and the Embarcadero. Learn from your guide about the history of these landmark sites, and get insider tips on places to visit after your tour. Your bus stops frequently for photo ops and free time to stroll around designated sites such as Seaport Village, where you can purchase lunch and go shopping. After seeing the highlights of San Diefo, your driver heads south across the US-Mexico border, then takes you on a 30-minute narrated tour by bus in downtown Tijuana. Stop at Avenida Revolucion and have two hours on your own to check out the vibrant markets, shops and bazaars. Street vendors sell crafts, pottery, textiles and other souvenirs, and you can also sample a taste of Mexico in the restaurants, where you might hear authentic mariachi music and sip a refreshing margarita (own expense). Upgrade your tour to include a scenic one-hour cruise around San Diego Bay, taking in top sights such as the Maritime Museum of San Diego, the Star of India historic ship, US Navy aircraft carriers and submarines, marine animals and more. The cruise takes place aboard a comfortable boat with onboard commentary, and is scheduled before the Tijuana excursion.